For the second year in a row, Signature HealthCARE of Putnam County has been recognized as an Advanced QAPI Accredited facility in the United States. 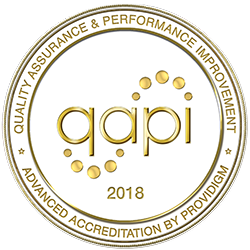 Providigm’s QAPI Accreditation is based on standards for excellence in continuously improving quality of care and life for nursing home residents. Nursing homes and centers are evaluated on a quarterly basis.